Pricing Starts at $1,195 Installed. The ATMOX ATTIC Ventilation Systems offered by Coastal Dry Home are more than just attic exhaust fans. The ATMOX ATTIC Ventilation System is designed to manage moisture in the attic and to reduce the effects of extreme heat in the attic. Most Attic fans are simply triggered by a thermostat, which turns the fan on upon reaching a set temperature point to exhaust air from the attic. The fans will then exhaust the hot attic air out and replace air from the outside. ATMOX ATTIC will also trigger fans to come on at a set high level temperature point to reduce heat. However, ATMOX ATTIC is designed to use both exhaust and intake fans. This will enhance air flow where outside vents are limited and will reduce any negative pressure on the attic. Often if only high powered exhaust fans are used on an attic, the attic will cool in temperature. However, if the intake of air from the outside is not sufficient to make up the return, the air can be sucked out of the living space of the home. This would not be an energy efficient way to cool the attic. By balancing air flow, the ATMOX ATTIC System mitigates this. With more sophisticated controls, depending on conditions, the ATMOX ATTIC system can also run as temperatures stay cooler. This allows the attic temperature to come down further than from the preset thermostat level, for example when a cold front comes through. 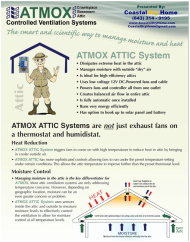 Managing moisture in the attic is the key differentiator for ATMOX. Most attic ventilation systems are only addressing temperature concerns. However, depending on geographic location, moisture can be even greater concern or problem. The ATMOX ATTIC System will continue to monitor the attic conditions beyond the high temperature triggers. The ATMOX ATTIC System places sensors inside the attic and outside to get temperature and humidity levels to effectively control the ventilation. Based on these readings and corresponding dew point calculations, the ATMOX ATTIC System will trigger fans accordingly allowing for moisture control at all temperature levels. Additional settings can be adjusted based on geographic area and needs. For certain geographic areas and climates, the creation of ice dams and ultimately the melting of ice into the attic is a major concern for homeowners. The warm air that escapes from the home is often a primary source of the problem. Proper sealing between the attic and home is very important to reduce the effects of ice dams. Even with proper sealing, warm air can still escape into the attic. As the warm air builds up the snow will melt and then refreeze into ice creating a dam or bridge at the overhang. Ultimately that ice could get big enough where water runoff is blocked and backs up under the roof shingles creating water damage. The ATMOX ATTIC system is equipped with an optional Winter Mode setting designed to reduce the warm air during these times. The software has very specific temperature parameters in place to operate the fans. When the Winter Mode is activated, the ATMOX ATTIC System is designed to allow the cold air to come into the attic and dissipate the heat. This in turn can reduce the likelihood of an ice dam formation. 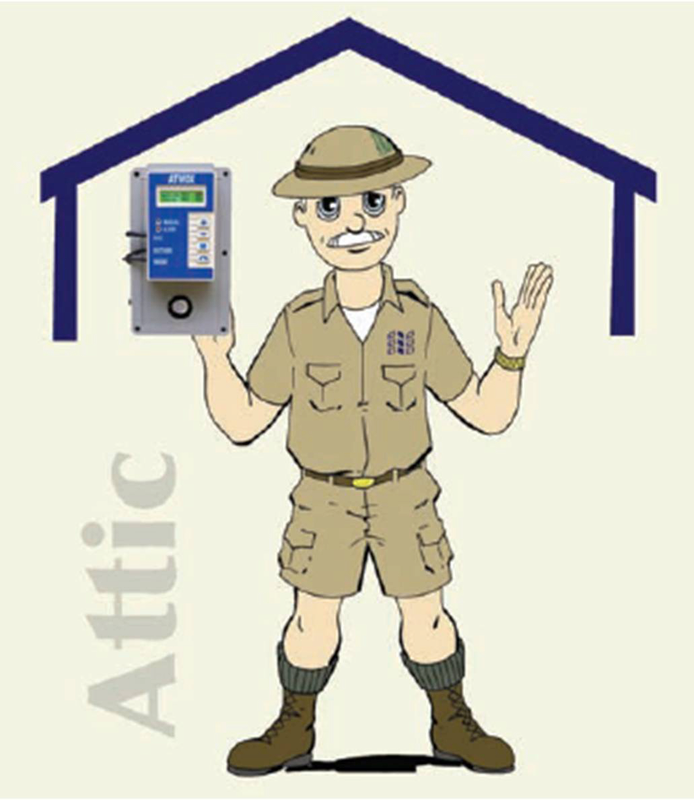 ​With ATMOX ATTIC, there are various fan configurations to adapt to any type of attic. Fans can be mounted for use in roof caps, gables, soffits or ridge vents as needed. ATMOX Fans are also designed as intake or exhaust to balance air flow. Additionally, there are dead space or cross flow fans to enhance air movement as needed. The ATMOX ATTIC fans use DC-Power from a low voltage cable and power supply. This allows for creating ventilation in areas that may not already have electrical outlets.